I got into rap music completely by accident. But the weirdest thing about it is, the experience ended up being pretty good to me. You see, back in the eighties, in one of those weird turns of fate, I ended up managing a record store in Tacoma, Washington called Penny Lane Records. Penny Lane actually proved to be a bit of a goldmine too — located right next to two military bases (McChord AFB and Ft. Lewis). The thing about this was that every other Friday when the G.I.s got paid, Penny Lane was a sea of green (as in uniforms and money). Man, did these guys like to spend their money on the jams. As for me, as a twenty-something, long-haired white guy reared on my own version of the "jams" (mostly by seventies rock bands like Deep Purple and Uriah Heep), I found myself having to adapt rather quickly to the then new world of funkateers like Cameo and Parliament-Funkadelic. Suddenly, I found myself catering to the needs of a lot of young black guys transplanted to Tacoma from towns like New York, Philly, and D.C. Okay, fine. So be it. Being the young, hungry guy dying to make it in the music biz I was at the time, I was all too ready to meet the challenge, too. In yet another one of those odd twists of fate, it just so happens that right at about the same time the whole rap thing was just beginning to explode. And at the time — as hard as this may be to believe now — there was virtually nowhere in the Northwest to buy 12" singles by the likes of Grandmaster Flash, Kurtis Blow, and Trouble Funk. Recognizing what was happening, Seattle's music magazine The Rocket soon approached me to cover the phenomenon for the magazine. At about the same time, Tommy Boy Records artist Whiz Kid ended up in Tacoma as his military wife Betty got transferred to McChord. Whiz Kid's 12" single "Play That Beat Mr. DJ" is still recognized today as one of the earliest, pioneering examples of scratching. The now deceased hip-hop pioneer and I also became fast friends. Meanwhile, up in Seattle's largely black Rainier Valley district, the owner of the neighborhood record store there — Music Menu — had taken notice of my success at Penny Lane, and made me an offer I couldn't refuse to take over his business. Which is where I first met the artist the world would come to know as Sir Mix-A-Lot. At the time, Mix-A-Lot was just one of any number of aspiring rappers in the neighborhood looking for a break from the by now known to be connected guy at the local record store. I have one particularly fond memory of Mix giving me a tape — which I later listened to in my car on the drive home from work — where he called me out by name. So, I eventually wrote about him in The Rocket. At about the same time, a local DJ named Nasty Nes began playing Mix-A-Lot on his radio show, K-FOX's Fresh Tracks. 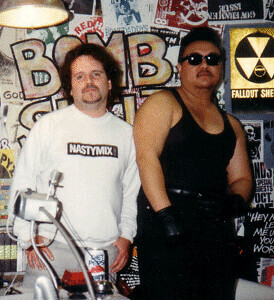 Eventually, Nes and a local promoter named Ed Locke would form the indie label Nastymix Records and release Sir Mix-A-Lot's records. When the local college station KCMU (now KEXP) asked me to host my own rap radio show, Nes and I — despite being good friends at this time — soon found ourselves as competitors. This is where I became the "Shockmaster" Glen Boyd. And although there is far more to this story than I have the time or space to go into here, we would soon find ourselves teaming up to host KCMU's pioneering hip hop show Rap Attack. And that is how your Rockologist became the "Shockmaster" for a brief time in the eighties. "Walk into a party, looking like Joker.."
It was one hell of a time. When Mix-A-Lot left Nastymix to join Rick Rubin's American Recordings, I also went along for that ride. I even accompanied Mix to the American Music Awards, where he won Best Rap Song that year for "Baby Got Back." Last summer, Nes and I got back together for a reunion on KEXP's rap show, which is now hosted by DJ B-Mello. It was a great, if somewhat bittersweet reunion. Anyway, another time that seems like a lifetime ago. 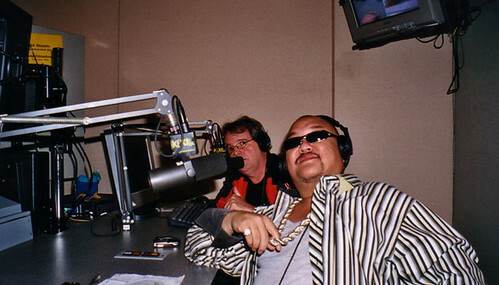 Obviously, your friendly neighborhood Rockologist is a long ways from his days as the "Shockmaster" of hip-hop radio and journalism in Seattle. And I'd still like a word with the WCW pro-wrestler who stole my handle, and tarnished my good name as a jobber. But I've still got my memories.